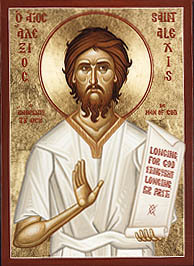 The rare title, "Man of God," was bestowed on St. Alexios for the manner in which he gave himself over to Jesus Christ, forsaking a bride even at the altar in order to fulfill to the letter the admonition read to him while he was contemplating enlistment in the service of the Lord. He kept his true identity a secret for an entire lifetime rather than run the risk of betraying the Master through his own emotions and there is no telling how much mental anguish he suffered in silence for the sake of his commitment. When he felt the call he answered with a hesitation for which he judged himself too harshly and which he bore in mute secrecy. Alexios was born in 380 AD in the eternal city of Rome during the reign of Theodosios the Great and was raised in a royal household by his parents, Ephemios and Aglaia, who discerned a predilection for the Church in their son, a religious fervour they could not share and which they sought to discourage for fear they would lose him. They lost no time in arranging for his marriage and in impressing upon him the debt he owed to his parents, for which he should respect their wishes in all things. He had reluctantly suppressed the call he felt to the Lord's service and had agreed to the marriage when he had a vision one day of St. Paul, who said he should answer the call to God at all costs, reading to him the passage in Matthew which says: "He that loveth father or mother more than me is not worthy of me." The bewildered Alexios was torn between his sense of duty to his parents and that urging to serve the Lord, and swayed between both, at long last deciding to go through with what he had promised his family. The feeling that he should go the other way gnawed at him even as he stood at the altar, and when the ceremony had been completed he looked upon the Cross of Jesus and without a word walked away from bride, family and friends to do what he had to do. He stepped into the anonymity of a Syrian monastery where for the next eighteen years he assumed another identity, and never looked back at Rome. Having made a choice they had opposed, he suspected his parents had disinherited him and that his bride had had the marriage annulled, but this was not the case. As a matter of fact, the bride had gone to live with his parents in the fond hope that Alexios would someday return, and the parents spared no expense in trying to locate their son, but after eighteen years with no word from him they presumed him to be dead. In his eighteen years in the monastery, Alexios was transformed into a respected holy man whose solemn dedication to Jesus was the subject of many discussions among not only the monks but the community which he served. Unlike other monks, he was a man of few words and left the preaching and sermonising to other brother monks while he concentrated on writing on many issues concerning the faith. The vision that he had had many years before of St. Paul still haunted him and he had a burning desire to go to Tarsus, Paul's birthplace. He boarded a boat bound for the short trip up the coast, but while at sea a violent storm arose and blew the vessel miles off course also leaving her a derelict at the mercy of the wind and tides. They were finally picked up by a ship bound for Rome and Alexios found himself back in the city of his birth. Nostalgia seized him and he went to the family estate, primarily to get a glimpse of his folks, but when they failed to recognise him he felt compelled to remain and was given the task of spiritual counsellor, not only to the estate, but to the neighbouring families as well. The abandoned bride was still living with the parents and she also failed to recognise him, for which he was grateful, for he found contentment in being able to serve the Lord while not revealing his true identity, which he considered would be a disservice to the Saviour after all the years of anonymity. He went about his duties with grace acquired and enjoyed the respect of families for miles around. When he felt death drawing near, Alexios wrote a letter to his family in which he expressed his love for them, which he could not do in life. The letter was read posthumously not only by his family but by the bishop of Rome, who had him interred in the chapel of St. Peter's. He died for Christ on 17 March 440AD, after thirty-four years of celibacy and anonymity.